Many female dancers develop Achilles' Tendonitis due to the nature of pointe work. Too often, ribbons that are tied too tightly restrict the ankles and create excessive pressure on the Achilles' tendon. 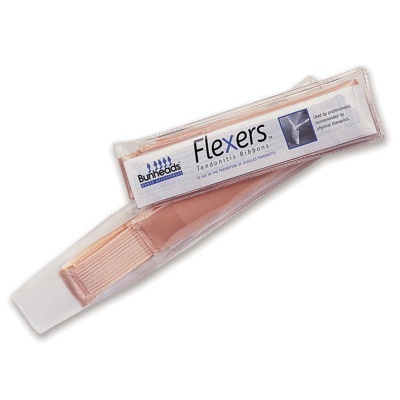 Flexers are designed to help alleviate the pressure that causes this irritation. They are snug and secure, yet stretch with the movement of the ankle. They enable the dancer to rise from plie, through demi-pointe and onto pointe with minimal constriction and no bagginess. Recommended by physical therapists, used by professionals. • 7/8" wide, durable, single-faced matte satin ribbon. Perfect for rehearsal shoes or the beginner dancer. • Color - Light Professional Pink. • Quantity - 4 Flexer ribbons per set.